Small - €38.99 Medium - €38.99 Large - €38.99 X-Large - €42.99 Only 2 left! Hey guy! What are you doing? You can't just jump onto the dance floor without the proper attire, especially when all those luscious ladies and disco-tacular dudes are busting moves under the disco ball. You need some retro studly swagger to compete with all of those other fine mamas and papas. You need something that makes people think of the Bee Gees as soon as you walk into a room. You need something that goes along with those sweet platform shoes that you have sitting in your closet. 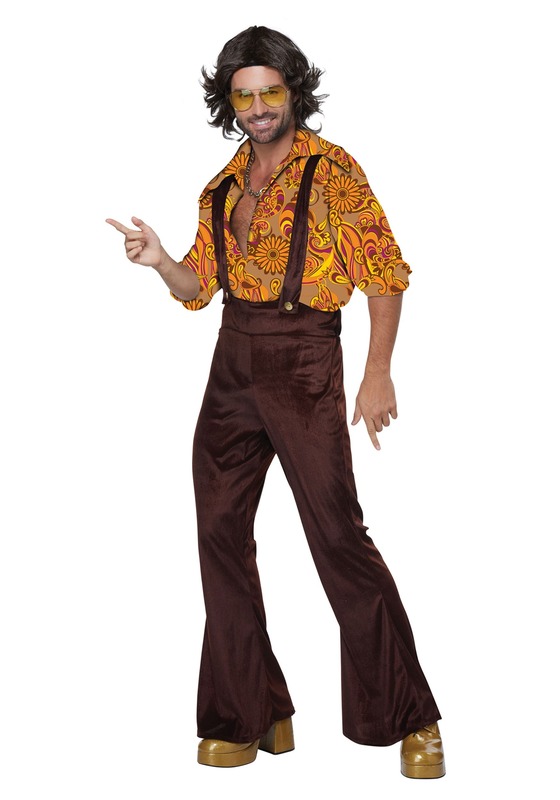 This Jive Talkin Disco Dude Costume lets your disco soul shine. You see, it's got a sweet psychedelic patterns all over it and lets you wear it with a deep V in the neck, so you can show off that masculine mane of 70's chest hair you have growing on your pecs. It even comes with a set of bell bottoms, because bell bottoms are the bomb and anyone who tells you differently does not have your best interest in mind. Just make sure you grow yourself some shaggy hair, a set of cool shades and a 70's mustache (a la Tom Selleck) to get the full on disco dude experience going on.